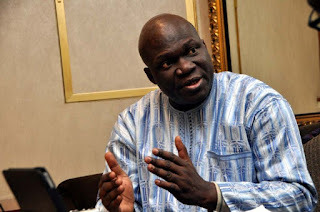 Who is listening to Reuben Abati, the pay-as-you-go journalist? Perhaps the people who do not know him and the corrupt brand of journalism he has practiced and epitomized all his life. There is no journalist in the Nigerian who does not know of this stinking personality. Recently, the so-called first class graduate of University of Calabar was reported to have written a piece – an Open Letter to Nnamdi Kanu, leader of Indigenous People of Biafra (IPOB). In the letter, the he taunted and made fun of the highly civilised and corrupt-free Biafran freedom fighter. Without any controversy, there are few journalists in the ungodly contraption called Nigeria that have gone through the crucible of the practice of journalism in Nigeria, suffered the hardships and persecution from the powers that be, and yet are standing strong with their integrity intact. Reuben Abati is certainly not one of them. Whenever you hear of Lagos/Ibadan media – noted for its corruption and lies – lying for the highest bidder, what you are hearing would be the activities of people like Reuben Abati. From his obscure days at Hints Magazine, until his corrupt journalistic write-ups brought him to Nigerian Guardian, he has always been the pay-as-you-go type of journalist. Unless you grease his palm, Abati will not write in your favour. There is nothing like “conviction” in his dictionary. Abati never takes sides on any controversial issue unless he gets bribed for it. He supports no course unless he is paid for it. He was one of those accidental journalists who, because they could not keep up to the fake results they acquired in Nigerian universities, crashed into journalism and turned the profession upside down. It is on record that to be in journalism (or in the media) in Nigeria and succeed, one does not have to be a graduate of the discipline – chiseled out in the best ideals, traditions and ethics of the profession. Instead, all one needs is the ability to make sense stringing English words together; then backed with the ability to tell lies and deceive. To be fair, there are few gate-crashers into the profession who were able to keep their heads to learn and practice journalism the right way. Rueben Abati was not one of them. In fact, he is among the many that sold their souls to the devil. Consider this; a recent revelation showed that Lagos State government alone has 700 journalists in different media houses in its payroll; and that is minus the social media. Such has been the case with all governments in the illegal contraption called Nigeria, especially its central government. Copy sales don’t sustain newspapers and magazines in Nigeria any more. Nobody buys them any longer; people only stand at vendors’-stands to look at headlines for free. Even adverts (space sales), which used to aid in sustaining the media in Nigeria no longer helps. The only means of sustaining journalists and media houses today is through governments/politicians’ sponsorship. So, do not be surprised that Lagos State is keeping 700 journalists within its payroll to trumpet none existent achievements. So journalists in newspapers and magazines, television and radio no longer receive salaries. They live by trumpeting government/politicians praises. At this juncture, it is instructive to explain that when Abati was allegedly arrested last year by the Economic and Financial Crimes Commission (EFCC), Biafrans were not fooled. It was just a smokescreen for his recruitment into the elite club of Buhari Media Committee (BMC). This was the group that generated the lies, deception and propaganda that foisted Muhammadu Buhari on the people in 2015. When eventually, Abati was “arrested” in October last year, eagle-eyed Biafrans suspected that it was a cloak and cover to recruit him for the genocidal onslaught that Buhari and his Fulani cabal were planning to unleash on Biafrans in their so-called “Operation Python Dance”. Abati is a member of the “elite” group that was recruited. Another one is a certain Yakubu Mohammed, a natural Northern irredentist that loves the spilling of innocent Biafran blood.